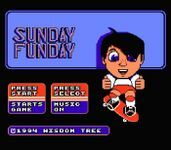 Sunday Funday, fully titled as Sunday Funday: The Ride, is a Christian video game that was released for the Nintendo Entertainment System by Wisdom Tree, formerly a subsidiary label of Color Dreams, in 1995. The game was the last to be released by any company for the North American NES. Like all Wisdom Tree games, Sunday Funday was not officially licensed by Nintendo. According to the game's instruction manual, the player controls a skateboarding hero who is late for Sunday school. In the game, the hero must use his skateboard and any objects he finds, such as balloons, grapefruits, and newspapers, to defeat bullies, clowns, and businessmen who are attempting to impede his path to Sunday school. The Sunday Funday game cartridge included two features other than the game itself - an arcade-style game titled Fish Fall and a sing-a-long of a song by Christian pop band 4Him. Sunday Funday is identical to the game Menace Beach, also released by Color Dreams, excepting a few graphics and a complete story change. While the hero in Menace Beach fights ninja and evil clowns on his way to rescue his girlfriend from Demon Dan, the hero in Sunday Funday fights bullies and businessmen on his way to Sunday school. Additionally, the hero carries a bible in Sunday Funday but not in Menace Beach. Finally, in Menace Beach, the hero's girlfriend appears wearing less and less clothing between levels, but she is replaced by a fully clothed Sunday school teacher in Sunday Funday. Source: Wikipedia, "Sunday Funday," available under the CC-BY-SA License.